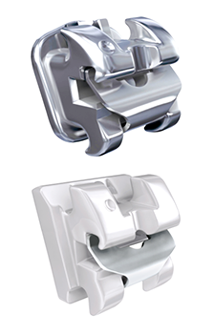 Self-ligating braces are made from the same material as traditional braces. Traditional braces are made up of three main components including the bracket, which is placed on the tooth, the archwire that runs through each bracket, and a “tie,” which connects the archwire to the bracket. Self-ligating braces eliminate the need for “ties” and instead use a permanent moveable component that is installed to hold the wire in place. In-Ovation® C brackets are an aesthetic option for adults and teens interested in reaping the benefits of self-ligating technology. Rhodium processed clips paired with natural-colored brackets allow In-Ovation® C brackets to provide the strength and performance of traditional self-ligating brackets without the look of metal. In-Ovation® R brackets provide an interactive self-ligating system, which has been recognized as an industry leader for more than a decade. Their true-twin design, full slot slip coverage, triple chamfered slot walls, smooth swept tie-wings and straight wire technology are just some of the aspects that allow In-Ovation® R to provide efficient treatment and trusted results.